Definition: Ischemia (is-KE’me-ah) is a serious condition in which there are inadequate blood flow and oxygen to a specific part of the body. It is generally caused by problems with blood vessels, with resultant damage to or dysfunction of tissue. It also means local anemia in a given part of a body sometimes resulting from congestion (such as vasoconstriction, thrombosis or embolism). Ischemia is a severe condition that can cause tissue damage and loss of limbs. This condition will not improve on its own and requires appropriate medical attention. It comprises not only insufficiency of oxygen, but also reduced the availability of nutrients and inadequate removal of metabolic wastes. Ischemia can be partial (poor perfusion) or total. 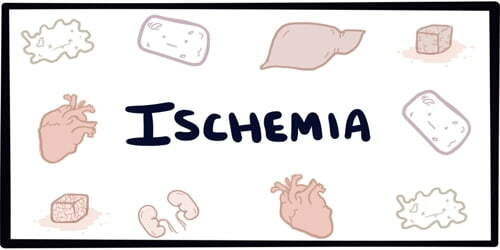 Ischemia itself comes from the Greek ‘ischein’, which means to hold back and ‘-emia’, which refers to blood or a condition of the blood. People usually get ischemia because of a build-up or blockage in their arteries. What it feels like and how it affects they depend on where they get it. But it can lead to life-threatening problems like a heart attack or stroke. Causes, Sign, and Symptom of Ischemia: Ischemia is a vascular disease involving an interruption in the arterial blood supply to a tissue, organ, or extremity that, if untreated, can lead to tissue death. It can be caused by embolism, thrombosis of an atherosclerotic artery, or trauma. Venous problems like venous outflow obstruction and low-flow states can cause acute arterial ischemia. In the heart, ischemia is caused by coronary artery disease (CAD) and can cause angina (an-JI-nuh or AN-juh-nuh) or a heart attack; in the brain, ischemia may cause stroke or transient ischemic attacks (TIAs, or mini-strokes) and; in the intestines it is known as mesenteric ischemia and can cause severe abdominal pain. 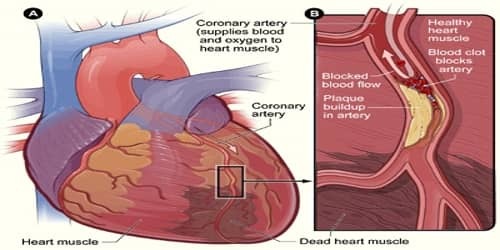 The risk factors are those for atherosclerosis: smoking, advanced age, high cholesterol, high blood pressure, diabetes, a family history of cardiovascular disease, sedentary lifestyle, and obesity. Diagnosis and Treatment of Ischemia: Diagnosis of ischemia depends upon its location. An ECG is a simple, painless test that detects and records the heart’s electrical activity. The test shows how fast the heart is beating and its rhythm (steady or irregular). An ECG also records the strength and timing of electrical signals as they pass through the heart. An ECG can show signs of heart damage due to CHD and signs of a previous or current heart attack. In some cases, particularly with critical limb ischemia, people may be sent for an arteriogram, which is an x-ray of the arteries while the dye is injected into the blood vessels. To diagnose a stroke, a picture of the brain with a head CT scan or a brain MRI is taken. Duplex ultrasound imaging, MRA, CT, or an arteriogram can also be used to assess or diagnose disease in the carotid arteries in the neck leading up to the brain. Early treatment is essential to keep the affected limb viable. The treatment options include injection of an anticoagulant, thrombolysis, embolectomy, surgical revascularization, or amputation. Anticoagulant therapy is initiated to prevent further enlargement of the thrombus. Continuous IV unfractionated heparin has been the traditional agent of choice. Surgical revascularization may be used in the setting of trauma (e.g., laceration of the artery). Amputation is reserved for cases where limb salvage is not possible. If the patient continues to have a risk of further embolization from some persistent source, such as chronic atrial fibrillation, treatment includes long-term oral anticoagulation to prevent further acute arterial ischemic episodes. If one experiences claudication in the legs or angina in the heart, a supervised exercise routine may be prescribed. Regular exercise may also result in other benefits such as weight loss, lower blood pressure, lower cholesterol, and better control of diabetes.